The front of the unique bag has large quilted appliques of turtle symbols. Use as purse, tote, beach or diaper bag...many uses! 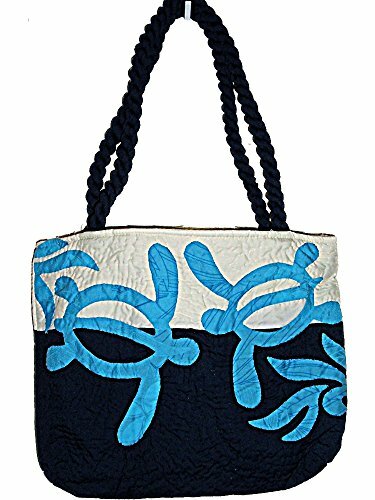 Dark blue bottom & straps with off white top with light blue batik fabric honu petroglyphs (theHawaiian word for sea turtles) appliques. A zippered closure with inside pockets & an outside pocket on the back. Braided handles. * A zippered closure with inside pockets & an outside pocket on the back. * The back side is also pictured, it is purple & white , but with no applique. Designed by Regency Creations in Honolulu & hand crafted in the Philippines. Very nice quality! Bag measures approximately 15" W x 12" H without the handles & 21" H with the handles. If you have any questions about this product by East of Maui Hawaiian Store, contact us by completing and submitting the form below. If you are looking for a specif part number, please include it with your message.